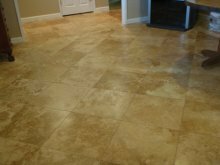 If you are in need of travertine cleaning services near Land O’ Lakes, Florida, Integrity Tile and Grout Cleaning can help you. Travertine tile floors tend to hold dirt and grime more than marble and non-textured ceramic tile. Also, because small holes open up in high traffic areas of your travertine floor, it's a good idea to have those holes filled to eliminate more places for dirt to be deposited. Maintaining your travertine floor not only requires periodically mopping, but also includes deep cleaning or a more aggressive scrubbing of the stone floor. Our travertine, marble and limestone cleaning services uses marble safe cleaning products with soft brush scrubbing and high pressure rinsing/vacuuming machines for large square footage floors. If you have a polished travertine tile floor and the polished finish is beginning to dull, we can polish your travertine tile floor, using polishing powders to polish to a high polished finish. We never use crystallizing chemicals to polish any marble or travertine floors. If you are not familiar with this technique of polishing floors, and all the long term damaging effects that come with it, no need to worry, as we only use safe powder polishing techniques. If your travertine floor has an abundance of etch marks or has dulled from an accumulation of scuffs and scratches, your travertine floor may need more restorative techniques which involves honing and polishing with diamond polishing pads. When it comes to travertine cleaning services or ceramic and porcelain tile and grout or just maintaining natural stone, we strive to help educate our customers on the best protection they can have, helping them save time and money in costly restoration costs down the road. We offer our services in Land O’ Lakes, Florida and surrounding area, but clean tile and grout and natural stone surfaces throughout the Tampa Bay Area. Check out these videos to see some of our work!